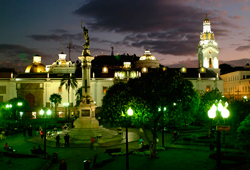 See the colonial highlights of Quito, the golden Compañia church and Panecillo Hill overlooking the city. 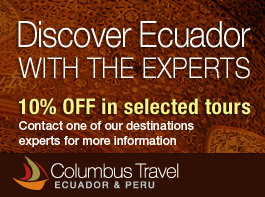 Visit the city of Quito and enjoy a city tour like none other. Declared a World Heritage Site in 1978, this beautiful and charming city is home to the best-preserved, least-altered historic center in Latin America. However, Quito's traditions and culture are not confined to the past: they continue to live on through the modern people of Quito, and their crafts, food, and legends. Discover the most important and charming locations of the city and be amazed by the delicate artwork in each one of them. Start your tour in the heart of the city at La Plaza Grande, or Independence Square, and be captivated by the history and legends of this plaza. In its center, surrounded by the archbishop's palace, the presidential palace and the Cathedral, is the monument of independence, an impressive sculpture that represents the might of the Ecuadorian people and their desire for freedom. We will continue to the Church of La Compañia de Jesus, one of the most beautiful and astonishing churches in the city. Built by the Jesuits in 1605 and finished in 1765, this church is a fine example of the architectural skills and crafts of the Quiteñan people. The church was built in a baroque style, and not a single wall is left without ornamentation. Carefully carved wood decorated with gold leaf adorns the interior of the church, along with an intricately decorated ceiling and historic artworks, which are found inside this Catholic temple. We then continue our tour towards the church and monastery of San Francisco. 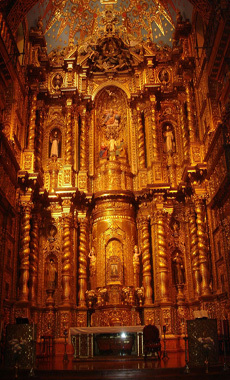 The construction of the church started in 1537 (only one year after the founding of Quito), and its construction took over 150 years. The plaza named after the church is a beautiful site too. From here you can admire the surrounding mountains that protect Quito; and on its steps, some of the most popular legends were forged, such as the legend of Cantuña and his pact with the devil. Let yourself be captivated by the beauty of the city and the history and traditions preserved by its people. We will end our tour at Panecillo hill, named for its resemblance to a small bun. This hill is the perfect viewpoint to look over the Old Town. At the top of the hill, a 30-meter high Virgin Mary sits atop an 11-meter high plinth, looking over the city and protecting its people. Visit to the Panecillo hill.